Through tone, Diatonis (a.k.a. Stuart White) intends to capture life. Using the fluctuating forms and boundaries of the Ambient and New Age Music genres, his music reflects the inherent values and natural canons of harmonious proportions, refinement and reverence. 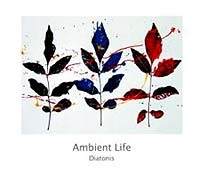 With the triple CD set, Ambient Life, he molds disconnected sounds into dramatic gestures (perhaps by refocusing his work in abstract painting as musical exposition). The total of 23 tracks each run their course in a range of five to ten minutes. The pieces seem to play out in a simple manner, but on closer inspection we find that this artist is profoundly manipulating our surroundings - the subliminal arrangements and evocative atmospheres providing each scene with its own unique tint and a connectivity to the previous, the next and that which is external to Ambient Life. Diatonis uses an interesting assortment of instruments. Most identifiable is the guitar, but the majority of sounds and timbres cannot be traced back to their origins as, throughout this album, simple acoustic sources are electronically manipulated and mutated into wonderful auras of tonality. The result is music that is alluring and warm yet remote and reserved - sometimes cool but always keenly expressive. Ambient Life is truly beautiful, forthright Ambient Music. This album serves wonderfully as music on the periphery of perception yet stands up quite well under close scrutiny. Though a high-concept studio album, the music is never mechanistic or vapid. The smooth, shimmering atmospheres and drifting remembrances accommodates the sleeping dreamer as well as it absorbs the contemplative listener.